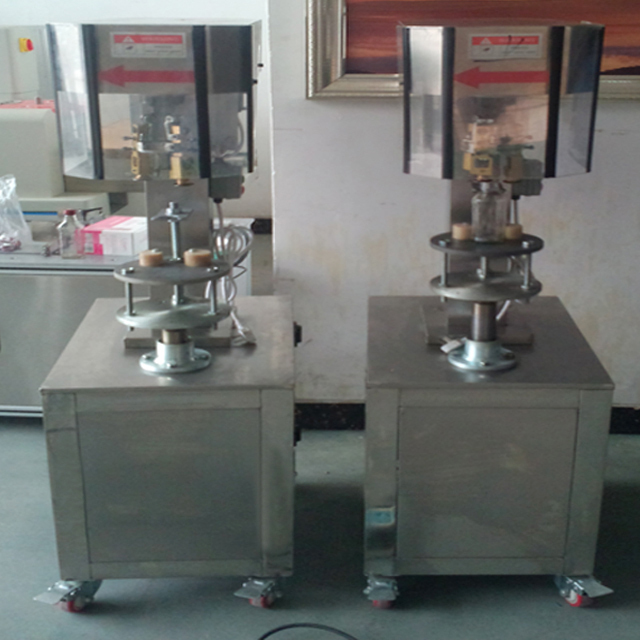 The semi automatic capping machine model YX-RC370 is suitable for packaging volume of aluminum caps. 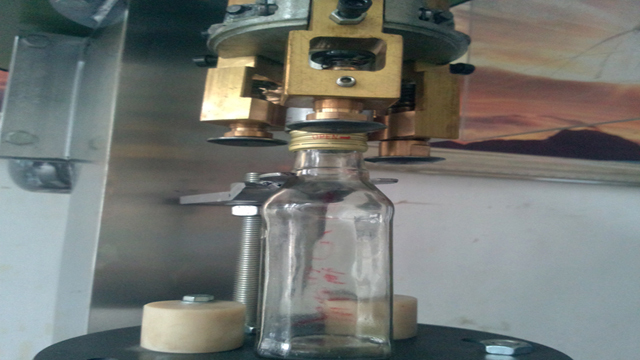 The machine compared with other similar products is notable with the advantages: First, using a four-claw head balance-type for sealing the caps in uniform force; the second is having to make the shape of the bottle by bottle deformation, and then rolling thread flange sealing function. 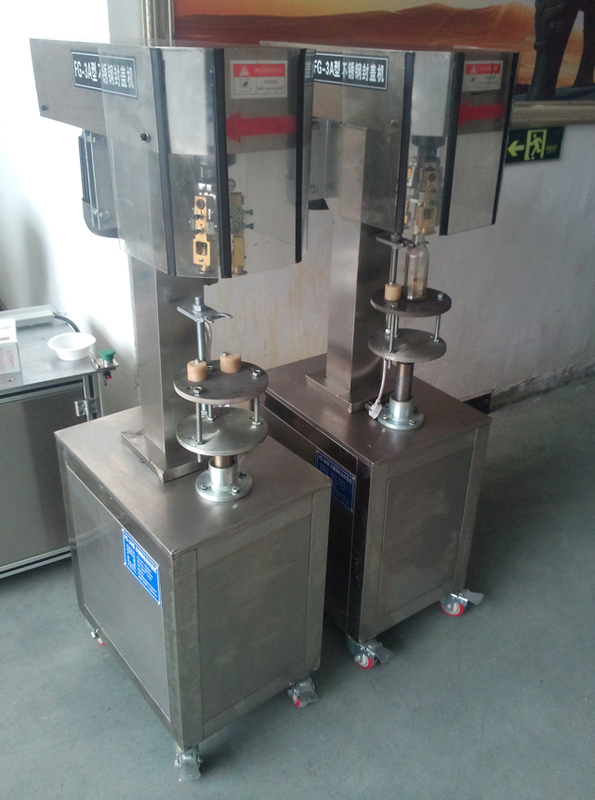 Also, the machine has a beautiful appearance, compact structure, reasonable design, stable operation, low noise, sealing speed, good sealing quality, and suitable for all kinds of wineries, beverage plants, breweries, pharmaceutical plants and other production companies. 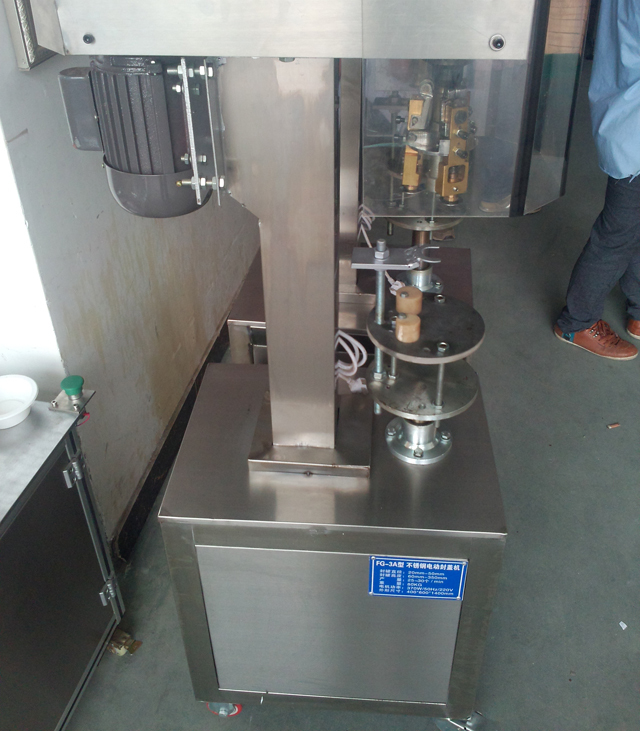 While the machine is multifunctional by changing different head parts to seal different kinds of caps like three anti-plastic cover cap and cover, chrysanthemum cover. Working principle of machine: Drive the rotation of main shaft from the dynamic of motor by the gear reducer; The rotation among curve camshafts is converted into the force which drives the capping head to move upward and downward; At the same time the gear reduce drives the curve camshaft in the bottom to make the star wheel move intermittently which matches up with the up-and-down movement of capping head. 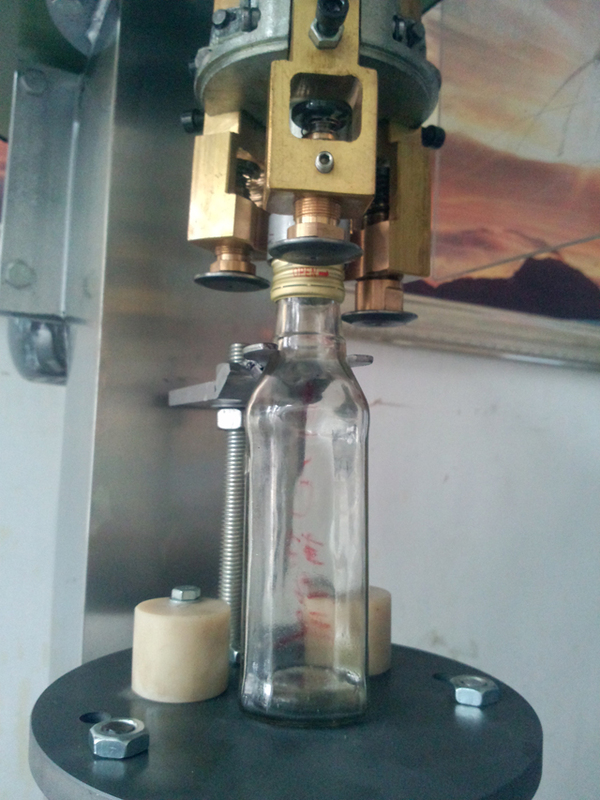 The upper variable speed motor let the capping head works by driving the belt; When the star wheel rotates the bottles below the capping head which punches the binding face between cap inner liner and bottle mouth; Meanwhile the fit thread screw is completed from the the flanging and rolling pilfer proof ring. Finally the perfect capping effect comes out. The machine should be re-adjusted when different bottles are changed. 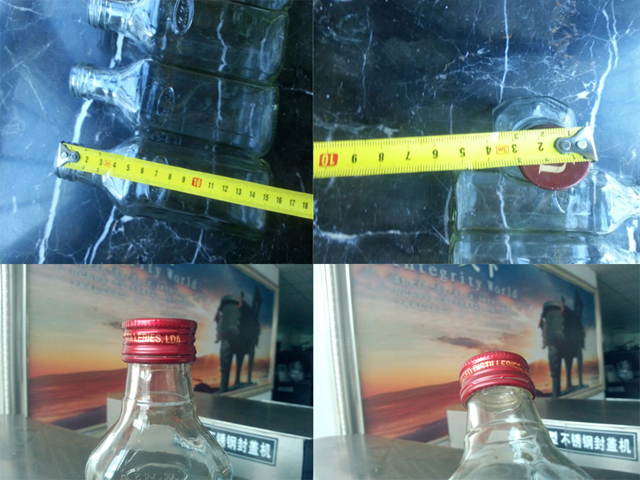 There are several capping heads in the machine for different sizes of bottles .Choose the matched capping head according to the certain bottle. 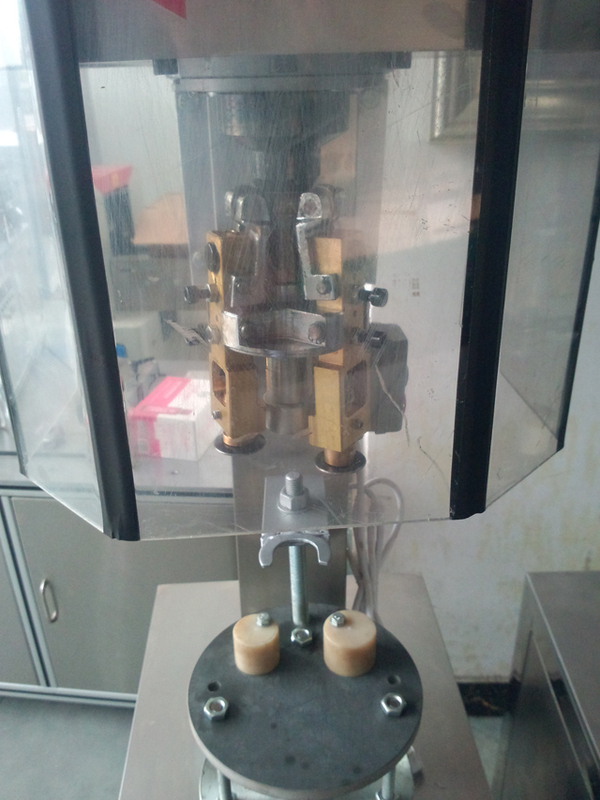 To change capping head: Loose the fixing nuts from the top of capping head to dissemble the whole set of capping head ,then adjust the new capping head until the perfect effect turns out.The punch of capping head is the left-hand thread screw. ①Never do the repairing work or any other unusual operation on the machine without cutting off the supply power! The human safety is first important! ②after being installed must be connected with the ground wire. Power connection should conform to the safety rules and anticreeping requirements.